Does one ever really have freedom? Carmine wanted nothing more than for Haven to have her freedom, but in order to give Haven the freedom that she deserved, he was forced the give up the freedom that he had. It appeared Carmine had made a deal with the devil, a devil by the name of Salvatore, the head of the mafia in Chicago. Carmine and Haven had been through hell in the year that they'd known each other. Their love for each was strong, a one of a kind. A love that rocked Carmine to the core. That's why he made the decision that he did. Love isn't always fair, but when we are in love, we usually sacrifice our own happiness to ensure that the ones we love are happy. Carmine gave up his future to the mafia family to ensure that Haven would have the future that she only dreamed of. Carmine knew that Haven had a bright future ahead of her as long as Carmine wasn't a part of it. When Carmine leaves Haven, she struggles to find herself. Haven needs Carmine; he's the air she needs to breathe. But, over time, Haven realizes that Carmine is not coming back, so she decides to move on with her life. A life that she never thought wouldn't include Carmine. They'd planned a future together, places they wanted to explore together. Only now, Haven was forced to explore them on her own. Carmine's uncle, Corrado vouched for Haven to the head of the family. Haven was now Corrado's responsibility. Corrado made sure that Haven was still safe, especially knowing what he knew about her. Haven was in danger whether she was with Carmine or not. Carmine has seen a lot of blood shed in his life. When Carmine's world is turned upside down once again, he withdraws like he did when he was just a small boy. How much heartache can one guy handle. Carmine has handled more than most should ever be exposed to. Will Carmine try and find happiness in the life he was forced into? Will Carmine be able to live a life without Haven? Is the future Haven has the future she wants? Will Haven ever try and find Carmine? Will Carmine ever try and find Haven? Can the two of them "really" be happy without each other? Throughout this book, I was on the edge of my seat. I kept reading because I didn't want to put the book down, as I needed to know what was going to happen next. I have to say, that at the end of the book, I was left wanting more from this family. Yes, the DeMarco family was in the mafia. We are supposed to believe that they are BAD because of the lifestyle that they lead. However, I felt the exact opposite. I fell in love with this family. Vincent may have made a few wrong decisions along the way, but every decision he made was to protect the ones he loved. That included Haven. Corrado appears to the a heartless man, a killer. In reality, he protected what was his. His family meant the world to him, and Haven was part of his family. 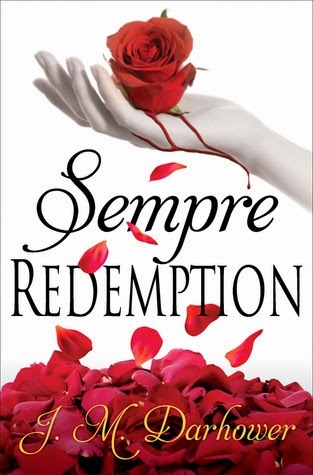 Sempre and Sempre Redemption will leave you wanting more. I cannot emphasize enough, that this series is a MUST READ!!! They are by far, in my top 5 2014 reads. I am a little disappointed in myself that I had Sempre on my Kindle for quite sometime and never read it. THIS IS A MUST READ SERIES !!! THEY ARE DEFINITELY IN MY TOP 5 READS OF 2014 !!! I confess as well that I had the first book for months, and never read it. It was surprisingly good. And now I have had the second for months, and I know I just need to open the first page and read.